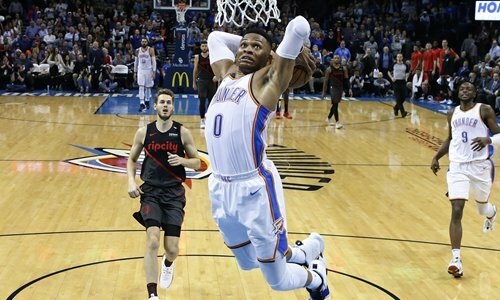 Russell Westbrook bagged his 14th triple-double of the season as the Oklahoma City Thunder overpowered Western Conference rivals the Portland Trail Blazers on Tuesday. Westbrook finished with 29 points, 10 rebounds and 14 assists - to reach double digits in three key statistical categories - while teammate Paul George led the scoring with 36 points in a 123-114 victory at the Chesapeake Energy Arena. While Westbrook and George led the Thunder's scoring, they received support throughout the lineup, with every starter posting double digits. The burden of Portland's scoring was once again shouldered by Damian Lillard, who had 34 points. C.J. McCollum added 31 points while Bosnian international Jusuf Nurkic added 22 points. In the Eastern Conference on Tuesday, Toronto bagged their 36th win of the season with an emphatic 120-105 defeat of the Sacramento Kings at Toronto's Scotiabank Arena despite resting star Kawhi Leonard. But the Raptors clicked into gear in the second quarter to build a four-point lead at halftime which held onto after the interval. Center Serge Ibaka again had a monster night, snagging 10 rebounds while chipping in with 15 points. Toronto ace Leonard, meanwhile, is expected to be rested once again when the ­Raptors face the Pacers in Indianapolis before coming back to the starting lineup for Friday's test against Houston. In Tuesday's other games, Dennis Smith Jr returned from his mysterious weeklong absence to help the Dallas Mavericks claim a 106-98 win over the Los Angeles Clippers. Smith Jr, whose absence had been attributed variously to a sore back and a stomach bug, scored 17 points on his return, along with Luka Doncic, who also had 17.